You can take a look at this instruction video, or you can follow along with the steps below. Go to Appearance -> Themes -> Add New -> Upload Theme, choose the zip file that you just downloaded from themeforest and click on Install now. When the theme is installed click on Activate. After the plugins install click on the link Return to Required Plugins Installer at the bottom of the page or go to Appearance -> Install plugins. Now select all plugins, select the Activate action and click on Apply. The WooCommerce plugin will intercept your next action and display the “setup wizard”. For now you can just click on Not right now, because we will get back to woocommerce setup a bit later. After clicking the button, the error “You do not have sufficient permissions to access this page” might show up, this is because of the WooCommerce forced setup wizard and all you need to do is go to your WordPress admin dashboard URL (/wp-admin/). Go to Appearance -> Import Demo Data and click on Import Demo Data button. That will import all content, widgets and also set some default options. This might take a few minutes. The next step is to set the Custom Menu widgets. Go to Appearance -> Widgets, click on Our Services sidebar, open the Custom Menu widget, select the Service Menu from the drop down and save the widget. Do the same for the two Custom Menu widgets in the Footer sidebar. 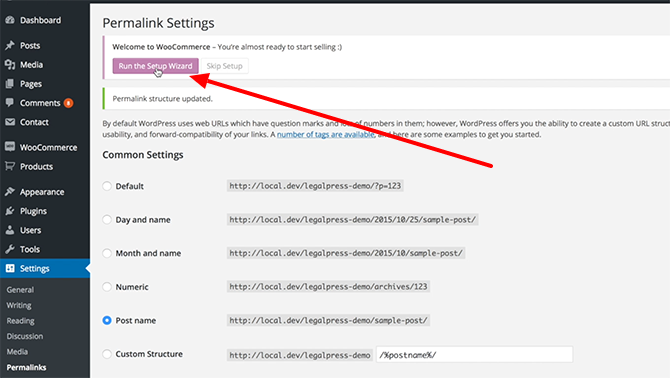 Go to Settings -> Permalinks, select the Post name option and save the changes. Finally click on Run the Setup Wizard button and follow the steps in the wizard to setup the WooCommerce plugin. You now have the exact copy of our demo site (only the images are blurred, because of the copyright).